Note: In the next post I show a few additional steps commonly used when creating the sockets. See extra. 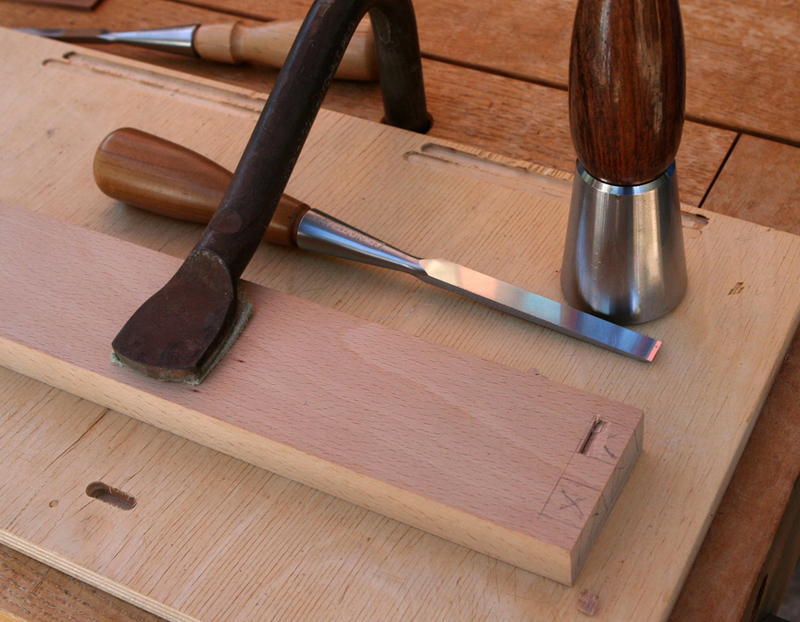 I now prepare the sockets in the pin board which typically is a drawer front or case top and bottoms. I alternate vertical cuts with horizontal cuts to pop out waste, staying away from marks until the bulk of the waste is removed. 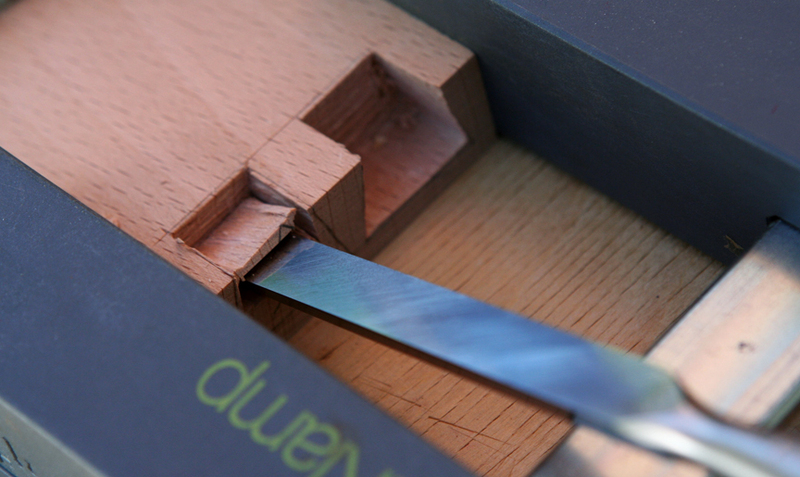 The outside half pins can be quite fragile so it is good to reinforce them with clamps [see photos]. 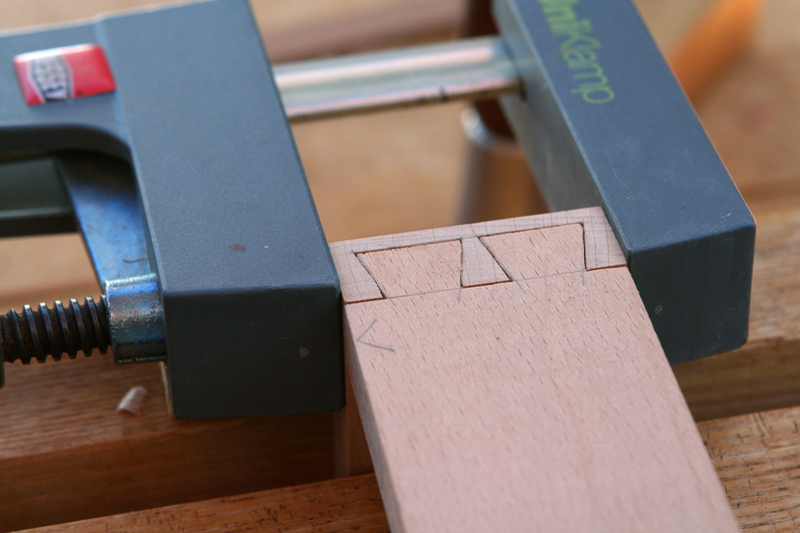 Some people will use a trim router for this task. That helps give uniform floor for the socket. 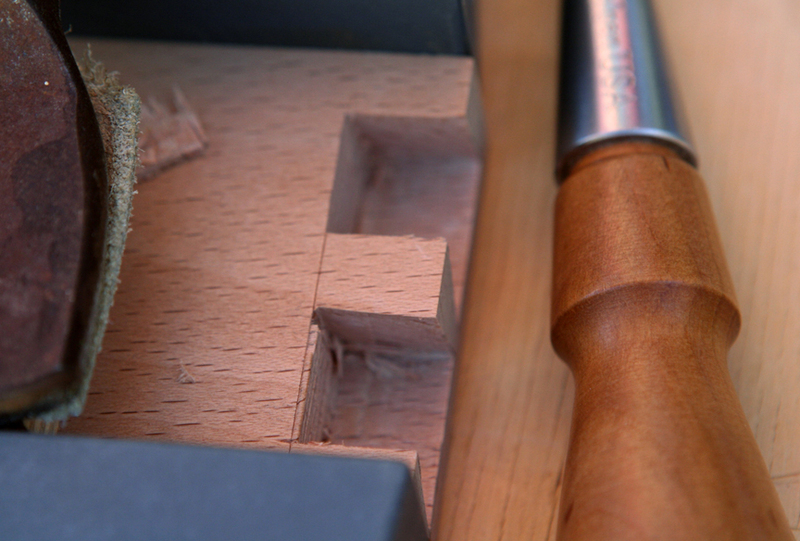 Another approach is to use a Forstner bit in the drill press to achieve the same result. 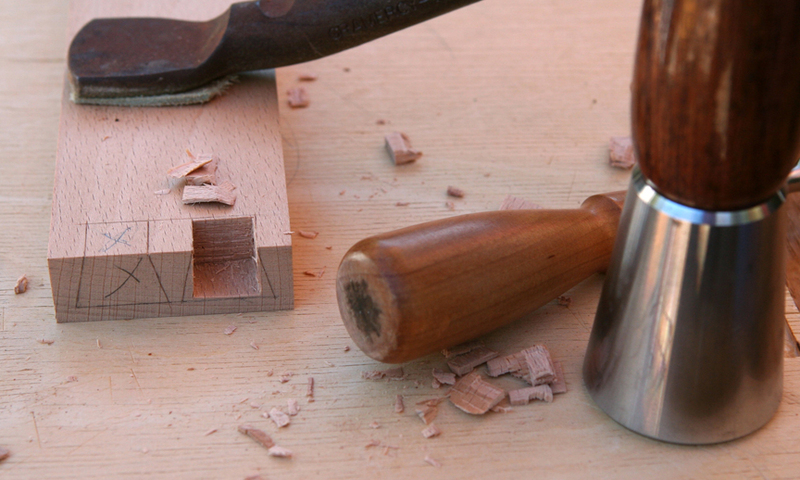 I am attracted to using the chisel approach. 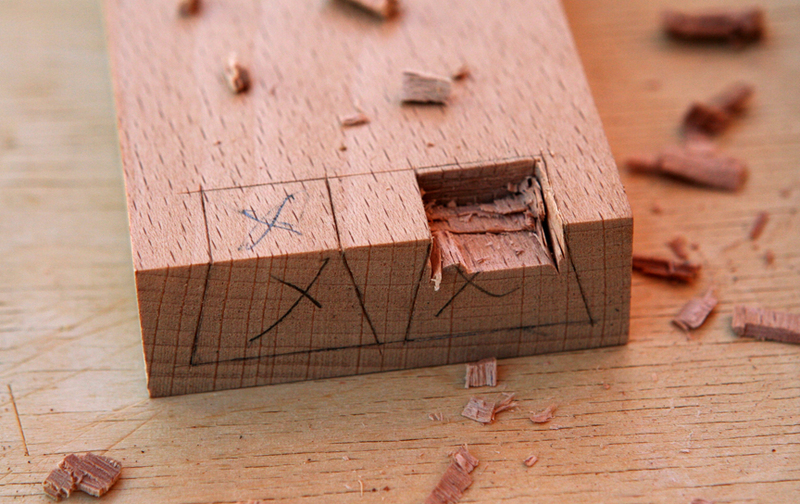 One drawback is the possibility of the horizontal chisel cuts diving downwards following grain direction. 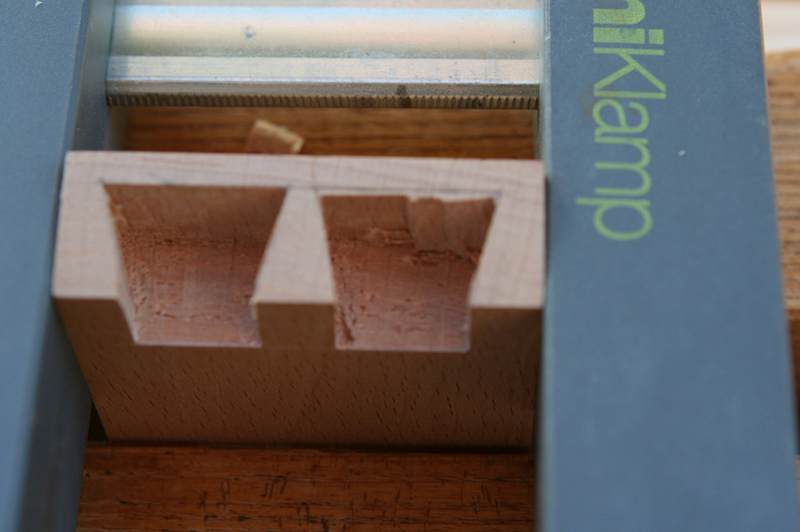 I try to be careful and save the final “horizontal” cuts for when I place the board vertically in my Moxon vise. After the bulk of socket waste is removed, I chop down the knife line. Then placing the board in the Moxon vise I make the half-blind cuts and make other refinements which are easier to see in this orientation. I test the fit further refinement as necessary. I leave the clamp in place for the fitting if possible. This demo was made with two test boards. At a later date I’ll post some pix of this same procedure with a real project. I am currently working on a book cabinet which has a nice drawer. Stay tuned.